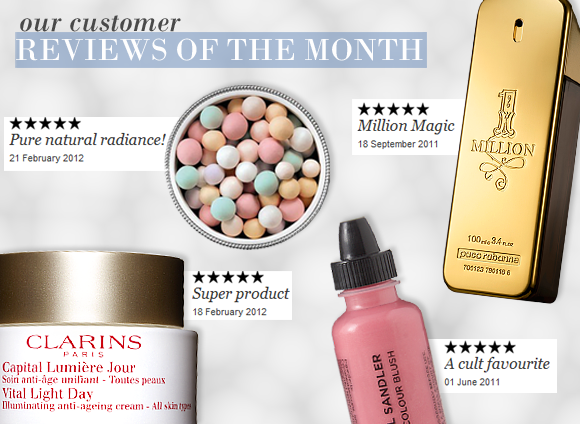 Below are our favourite reviews for July. Review are picked for being helpful, insightful or just really interesting. “This cute Stila beach palette is great value for money! Four eyeshadow colours, 1 blush and 1 highlight colour (the box calls it a bronzer but I find it rather pale to be a bronzer) in a cute book-like box, a mirror and a how-to are included. The colours are very pretty and easy wearable. The eyeshadows are soft, have great colour pay off, are easy to use and easy to blend. The blush and highlighter are beautifull and make a great combo for everyday use. The size of the powders is average, not too small nor too big. I think this is the right size for this kind of palette. The colours are very easy to work with, this palette is very versatile and makes a great start for lots and lots of beautiful looks. A good eyeshadow base makes the staying power of the colours even more outstanding. “I’ve read a lot of so-so reviews about this fragrance, but for me this is outstanding, and undoubtedly one of my favourites. The fragrance has a lot of herbal greenness to it, very little of a sweet muskiness (thank god – there are far too many of those), and strong woody presence of moss and sage (I’m assuming that’s the guaiac), but with a hinting presence of bergamot. It seems to pass into nothingness after a while and yet every so often, particularly on warm days, your senses grasp at its cool clarity, and immediately I find it both rewarding and relaxing. Great fragrance, unique, compelling and well worth a try. “I’ve been on a perfume odyssey recently and I ended up at the altar of Serge Lutens with a bottle of 5 O’Clock. It opens with a heady blast of bergamot, citrus with a background of warm spicy ginger. It’s sweet, spicy and lemony. The heart notes are supposed to be black tea with a honey note. I must say I’m not that familiar with the scent of black tea, but you really get the honey tempered by a delicate, woody, smoky note. The dry down I’m left with is a lovely spicy ginger, again with a background of wood embers and a hint of vanilla pod. It last a good 4-5 hours on me and while the sillage isn’t so much that it knocks colleagues out in the lift, it’s enough that I get the occasional waft and I assume others do too. Serge Luten's Five o'clock au gingembre is an warm, inviting fragrance, that ignores it's name completely to give you a personal, "snuggly" experience. The opening isn't one bit as you'd expect. Thinking you'll get a blast of fresh ginger, instead you get a blast of citrus, lemons to be exact, Sugary lemons. It's quite something and the perfect opening for what turns out to be quite an off-kilter fragrance. There's a spice in there, sort of like a baking cake, almost like the little sister to Serge Lutens Arabie. Then, you'll start to get the florals, a dash of honey, not overbearing, but quite pretty. Amazingly, still no ginger, but by this point you don't mind. A sweet musk starts in the dry down. It's quite something, and a very wearable fragrance, especially if you're normally wary of other "sugary" Serge Lutens fragrances. This entry was posted on Friday, July 1st, 2011 at 10:22 am and is filed under Reviews of the Month, Tried & Tested. You can follow any responses to this entry through the RSS 2.0 feed. You can skip to the end and leave a response. Pinging is currently not allowed.